The first line indicates the focus of the entire text: God's ways may well be mysterious to us, but God does act! He "works his sovereign will" (st. 2), and someday "he will make it plain" (st. 5). In the meantime, even in periods of profound doubt and despair, we may trust God's wisdom. and sometimes we are worried about things. and that you make us who we are. Please forgive us for thinking about ourselves first. Please forgive us for not trusting you to take care of us. even when we forget that we need you. Great God, sometimes you speak but sometimes you fall silent. Your ways are deep, O God. Sometimes you prevent evil but sometimes you permit it. You chose a difficult people to bless the nations of the earth. In Jesus Christ you entered our world to save it. Your ways are deep, O God, and sweet at the end. Amen. Consider using Lift Up Your Hearts #23 “Children of the Heavenly Father,” #24 “Affirmation: God as Creator and Provider” and #25 “God Moves in a Mysterious Way” together in a medley. 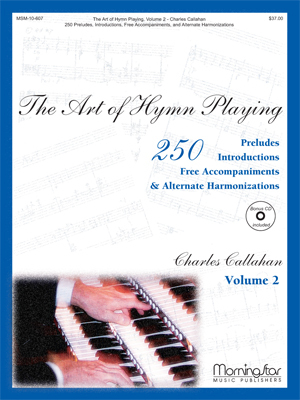 Begin by singing #23 “Children of the Heavenly Father”—use an appropriate accompaniment for the words of this delicate prayer with instruments such as piano, guitar, flute, soft organ, etc. The piano can continue to play softly in the background as #24 “Affirmation: God as Creator and Provider” is read, transition to the key of E♭ and play #25 “God Moves in a Mysterious Way” softly as the Affirmation is finished. 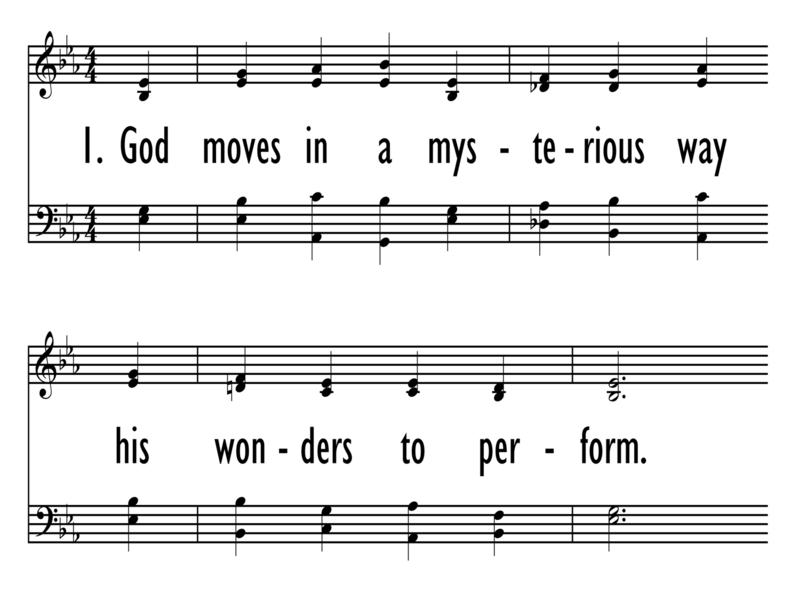 Lead into the singing of #25 “God Moves in a Mysterious Way” with a stronger accompaniment (louder organ, stronger piano, or whatever is available and being used). Erik Routley compared this text to a Rembrandt painting, saying it had a dark background with a strong streak of light falling across it. That is an apt analogy. Cowper wrote "God Moves in a Mysterious Way" in 1773 prior to the onset of one of his severely depressive states, which later that year led him to an unsuccessful suicide attempt. The text was published in Newton's Twenty-six Letters on Religious Subjects; to which are added Hymns (1774). It was also included in Olney Hymns with the heading "light shining out of darkness" and accompanied by a reference to John 13:7 in which Jesus says, "You do not realize now what I am doing, but later you will understand." DUNDEE first appeared in the 1615 edition of the Scottish Psalter published in Edinburgh by Andro Hart. 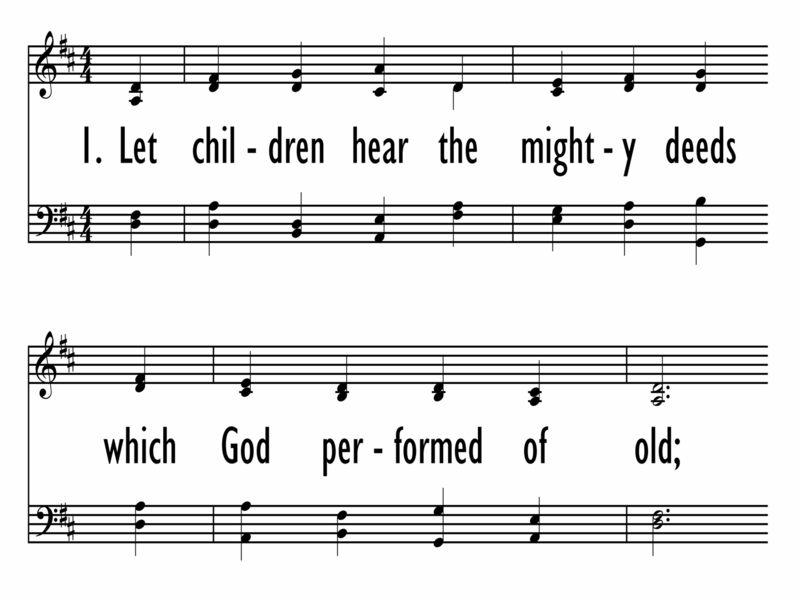 Called a "French" tune (thus it also goes by the name of FRENCH), DUNDEE was one of that hymnal's twelve "common tunes"; that is, it was not associated with a specific psalm. The tune is in isorhythmic form (all equal rhythms) and has a harmonization that was published in Thomas Ravenscroft's Whole Booke of Psalmes (1621). The tune's name comes from the city of Dundee, known as the "Scottish Geneva" during the era of the Scottish Reformation. DUNDEE fits the meditative character of the text; its smooth lines invite part singing. William Cowper (b. Berkampstead, Hertfordshire, England, 1731; d. East Dereham, Norfolk, England, 1800) is regarded as one of the best early Romantic poets. To biographers he is also known as "mad Cowper." His literary talents produced some of the finest English hymn texts, but his chronic depression accounts for the somber tone of many of those texts. Educated to become an attorney, Cowper was called to the bar in 1754 but never practiced law. In 1763 he had the opportunity to become a clerk for the House of Lords, but the dread of the required public examination triggered his tendency to depression, and he attempted suicide. His subsequent hospitalization and friendship with Morley and Mary Unwin provided emotional stability, but the periods of severe depression returned. His depression was deepened by a religious bent, which often stressed the wrath of God, and at times Cowper felt that God had predestined him to damnation. For the last two decades of his life Cowper lived in Olney, where John Newton became his pastor. There he assisted Newton in his pastoral duties, and the two collaborated on the important hymn collection Olney Hymns (1779), to which Cowper contributed sixty-eight hymn texts. 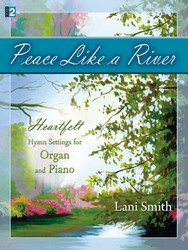 In addition to this hymn, “O For a Closer Walk with God” and “There Is a Fountain Filled with Blood” are also often included in modern hymnals. Little is known about Thomas Ravenscroft’s (b. circa Sussex, England, 1592; d. circa London, England, 1635) early life. It is believed he sang in the choir of St. Paul’s Cathedral, and probably received his bachelor’s degree in 1605 from Cambridge. Ravenscroft is principally known for his collections of folk music: Pammelia (1609), Deuteromelia or The Seconde Part of Musicks Melodie (1609), which includes the famous children’s song “Three Blind Mice,” and Melismata (1611). He also pulished a metrical psalter (The Whole Booke of Psalmes) in 1621. He composed eleven anthems, three motets, and four fantasias. He also wrote two treatises on music theory: A Briefe Discourse of the True (but Neglected) Use of Charact’ring the Degrees (London, 1614), and A Treatise of Musick.